Jun. 19 /CSRwire/ - SEATTLE, WA- June 19, 2007 – Specialty Roast Coffee Company has created a unique means for businesses to generate sustainable giving for their cause. With its corporate gift-giving program, Specialty Roast donates $2 per pound of their premium coffee to a charity the company chooses. Whether a company selects an education, environment or health non-profit, the company and charity are showcased on the bag of coffee. Says company founder Warren Sly, "With 80% of Americans drinking coffee, it is a natural choice for a business gift. The lucky recipients get to enjoy great tasting coffee and the custom label reminds them daily of the company’s social responsibility." 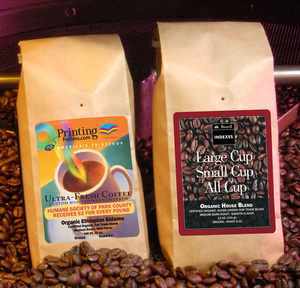 Russell Investment Group, www.russell.com, has been using Specialty Roast Coffee for client appreciation gifts since fall 2006. CHOICES Education Group, a Seattle-based national social enterprise, has been the beneficiary of this powerful yet simple program. "Russell gives back to CHOICES in many ways, and we appreciate this unique and innovative method," states Leo Muller, executive director. Kevin Lohman, director of global sales for Russell Indexes adds, "Specialty Roast's business model sets a new benchmark for corporate social responsibility. We love that our marketing effort for Russell also benefits CHOICES and its message to young people across the U.S. We’ve received numerous compliments for this innovative program – even from as far away as Paris." PrintingForLess.com, www.printingforless.com, America's first and leading online commercial printer based in Montana, has earned their local Humane Society thousands of dollars in contributions from Specialty Roast. Andrew Field, founder of PrintingForLess.com, was so impressed with the idea he personally asked Sly to add the gift-giving program. "As an Internet-based printing business, we realize the value of thanking our customers for taking that leap of faith," says Field. "Specialty Roast makes gift-giving convenient. They handle the fulfillment, and the fact that the coffee is fresh-roasted really makes it memorable. It's an added benefit that we have been able to support the Livingston Humane Society at the same time." Specialty Roast has expanded the program to create an innovative "one-click" ordering system with back-office integration techniques that keep ordering simple. Companies can design their own label, choose their charity and send an order with the click of a button. Specialty Roast handles the roasting, fulfillment and shipping so that the coffee arrives at its peak of freshness. Some businesses even opt for hand-written 'thank you' notes. "Besides our unique charitable donation, we stand out because of our freshness, quality and certification reassurances," notes Sly, adding "Our customers tell us they can taste the difference with our coffee." The program starts at $18.95 per individual order, which includes tax and shipping. Specialty Roast Coffee Company is an Internet-based roaster located in Bellevue just east of Seattle, Washington. Their mission is to give $2 for every pound to non-profits the customer chooses. The company was founded by Warren Sly, formally an ad executive with Ogilvy & Mather New York, who introduced Perrier Water into this country in 1977. Years later, Sly was challenged by a former Ogilvy colleague, now a Catholic priest, to start a company and donate the profits to feed the poor. The company roasts only specialty grade Arabica coffee from socially and environmentally-responsible growers and delivers coffee at its maximum freshness. The Internet store offers a wide variety of certified Fair Trade, shade grown and organic coffees. Customers can choose to support a cause from a growing list of nearly 300 local and national non-profits. Specialty Roast is a member of One Percent for the Planet and the Specialty Coffee Association of America. For more information go to www.specialtyroast.com. According to Russell Investment Group's website, www.russell.com, Russell aims to improve financial security for people by providing strategic advice, world-class implementation, state-of-the-art performance benchmarks and a range of institutional-quality investment products. With more than $200 billion in assets under management, Russell serves individual, institutional and advisor clients in more than 40 countries. Russell provides access to some of the world's best money managers. It helps investors put this access to work in corporate defined benefit and defined contribution plans, and in the life savings of individual investors. Founded in 1936, Russell is a subsidiary of Northwestern Mutual Life Insurance Company and headquartered in Tacoma, Washington. Russell has principal offices in Amsterdam, Auckland, Hong Kong, Johannesburg, London, Melbourne, New York, Paris, San Francisco, Singapore, Sydney, Tokyo and Toronto. PrintingForLess.com is the first and leading online commercial printing company in the United States. Located in Southwest Montana, PrintingForLess.com provides unmatched technical and customer support and instant online pricing and ordering for its full-color marketing materials. More than 60,000 customers nationwide, mostly small and mid-sized businesses, click on www.printingforless.com for affordable, full-color marketing materials including: business cards, brochures, postcards, newsletters, letterhead, and more. For additional information, please visit the website or call 800-930-6040. PrintingForLess.com Media Contact: Melanie Rembrandt, Rembrandt Communications, Melanie@printingforless.com, 406-823-7023.